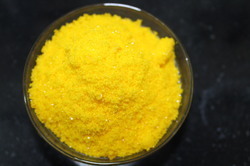 Leading Exporter of phosphomolybdic acid ar from Dhule. With the aid of our highly experienced professionals, we are instrumental in processing the premium grade Phosphomolybdic Acid AR. We have gained rich expertise in formulating the most advanced formula of Phosphomolybdic acid AR that is trusted widely for its higher efficacy. Precisely formulated under strict quality supervision, the hygienically produced chemical compound is adhering to the set industry standards. Further, we make sure to provide the purest form to our esteemed clientele at the market leading price. Looking for Phosphomolybdic Acid ?